I am doing the main campaign with Phillip of Macedon and I plan on making a complete play though of the game. Please check let me know what you think of my style and if there is any problems you see with how I play, I am always open to suggestions. Finally keep in mind I am doing this purely for the entrainment value and I am not very familiar with the history around this time period. Also if anyone does like the videos, please subscribe and like, I will be doing one of Hegemony Rome when its released. While I can't say I've had a chance to watch it all, it looks great and we really appreciate the effort you guys put into spreading the word on Hegemony. I've posted the link on our facebook page and will give it a tweet as well whenever Twitter decides to start working again. Thanks Rob, I really appreciated it. 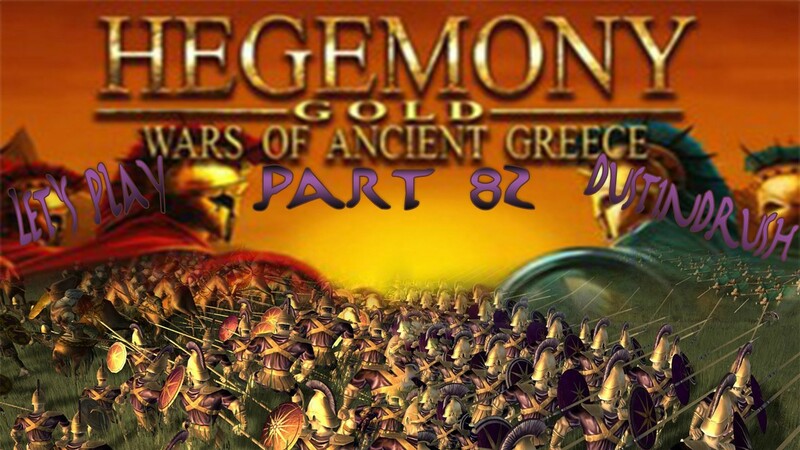 Hey guys, just posting to let you guys know I am up to part 78 in my let's play of Hegemony Gold: War of Ancient Greece. Here is the link to the video here, hope you guys enjoy and follow along. Check it out, comment and give me tips and ideas, I am always open to suggestions. Also be sure to thanks these guys for the great work with this game. Just pick up a copy and start having some amazing fun conquering Greece! I wanted to let you guys know, or atleast the people you do not watch my videos and want to watch my Hegemony play though, I will be uploading that every Tuesdays. Thought I would try and start a schedule on my video uploads so the people who do follow me for a one video or another will be able to tell when I am uploading them. Great series Dustin - Well done and so many editions! Thanks Brushy, I am going to start adding an outro to the Hegemony uploads for previous videos. Also I think I should stop breaking the videos into parts and just upload them as I play them, however I would like to ask what you guys think. I always like to hear what people think of the videos and hope they enjoy them, so any feedback will be good for me and for any who watches it ya know what I mean? Anyway, I will play it out till the end and when Rome comes out I will being taking over all of Gaul as the great Julius Caesar! Hey again, I have parts 81 and 82 up on my Channel. Let me know how they are, and hope you all enjoy! Thank you if any of you have subscribed to my channel! Right now I am at 492 almost about to break 500 and all I can say is wow, I am so excited! Anyway I just uploaded part 84 of my Hegemony Gold Macedon campaign, you can view it here. I hope you all enjoy these and continue to support me by commenting, favoriting, liking, and sharing my videos. If anyone would like to they can add me on steam and maybe play some games with me, as I am doing more videos where I play with my friends on games and record them. Anyway, thank you again and hope you all enjoy the videos and let me know what you all think about them! Until next time. Ughh, I don't like ads. I read you wanted to add them to your channel. I'll skip it for now. This is true, I do want to do this for a living, and the only way to really make a go of it is to have ads on them sadly. True as it is it doesn't help me, however I am not going to sit here and run away people who enjoy watching my videos by throwing a fit and complaining about adblock.